In Bion in Film Theory and Analysis: The Retreat in Film, Carla Ambrósio Garcia introduces the rich potential of the thinking of British psychoanalyst Wilfred Bion for film theory. By so doing, she rethinks the space of the cinema as a space of retreat, and brings new insights into the representation of retreat in film. Presented in two parts, the book seeks to deepen our understanding of the film experience and psychical growth. Part I places Bion’s view on the importance of the epistemophilic instinct at the heart of a critique of the pleasure-centred theories of the cinematic apparatus of Jean-Louis Baudry, Christian Metz and Gaylyn Studlar, proposing an idea of cinema as ‘thoughts in search of a thinker’. Garcia then moves from Bion’s epistemological period to his later work, which draws on mysticism, in order to posit an emotional experience in the cinema through which the subject can be or become real (or at one with ‘O’). Part II examines representations of retreat in four European films, directed by Ingmar Bergman, Pier Paolo Pasolini, Georges Perec and Bernard Queysanne, and Manoel de Oliveira, showing them to articulate a gesture of retreat as an emotionally turbulent transitional stage in the development of the psyche – what Bion conceptualizes as caesura. 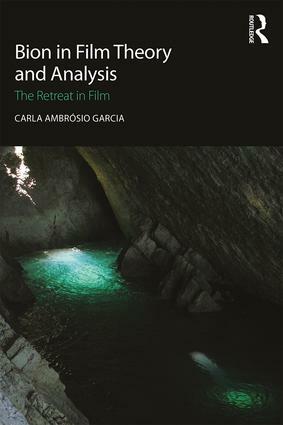 Through its investigation of the retreat in cinema, the book challenges common understandings of retreat as a regressive movement by presenting it as a gesture and space that can also be future-oriented. Bion in Film Theory and Analysis will be of significant interest to academics and students of psychoanalysis, psychotherapy, and film and media studies, as well as psychoanalysts and psychotherapists.